The radio industry was urged by a government minister to continue to collaborate to support a successful transition to digital. It came hours after the BBC's Chief Technology Officer reiterated the BBC's stance of keeping analogue FM in a analogue/DAB/IP hybrid world. He said that turning off FM would risk a loss of listeners. 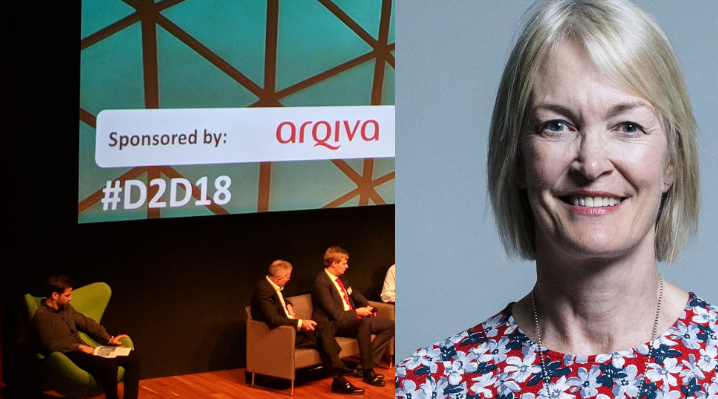 Margot James MP (pictured top right), Minister for Digital and Creative Industries at the Department of Culture, Media and Sport, made her comments via a video message at Drive to Digital 2018: The Future of Radio, a major radio industry conference sponsored by Arqiva, which was held at the British Museum in London, attended by 300 senior executives representing radio broadcasters, radio manufacturers, car manufacturers and retailers. In her video message, the Minister said that Government will need to examine carefully the progress made on digital radio and to work closely with all partners, including the BBC and commercial radio, Arqiva, car manufacturers, the supply chain and listeners. She said that she hoped to be in a position shortly to announce how Government plans to take the work forward. The message was immediately welcomed by broadcasters and the supply chain, and in a conference panel, senior executives from the UK’s leading radio broadcasters, BBC, Global and Bauer, said that they are fully committed to delivering radio’s digital future and looked forward to working closely with the Government. At the event, it was strongly implied that the government would be making significant announcements about a transition to digital radio during 2019. It was also confirmed that there had been a "couple of hundred" responses to Ofcom's call for expressions of interest in small-scale DAB. Senior executives from techUK, representing the technology sector, and the SMMT, representing the automotive industry, said that the digital radio review is an important milestone which they hoped would provide an actionable plan to accelerate the transition to digital that the supply chain, radio industry and DCMS can collaborate on. Elsewhere in the conference agenda, the progress made by digital radio and the achievement of the 50% digital listening threshold was celebrated, with speakers highlighting a series of major innovations and investments in digital radio content and coverage, including the return of Chris Evans to Virgin Radio and the expansion of the Sound Digital DAB network. There was also a focus on new initiatives and innovations in the areas of connected cars, smart and voice-controlled audio, and podcasts.